Someone recommended The Memory Book on Twitter, and though I can’t remember who it was, I must trust their judgement, because I hotfooted it to Amazon and bought it. It took me a while to get through it; I started it and wasn’t all that struck by it, so I put it aside and read something else. In the end, when I did go back to it, I enjoyed it a lot, certainly a lot more than I thought I was going to at the start. Claire is in her early forties, and a wife and mother, and she has been diagnosed with early onset Alzheimer’s Disease. It’s an illness that killed her father, and now it has come for her, and the book is all about how she and her family come to terms with it. One of the ways they have of coping is to start a memory book that they can fill with mementoes and stories that might help her to keep a hold of the person she is when the disease becomes more advanced. It’s also something she can leave behind for her daughters and husband when she is gone, whether that means gone in a physical or a metaphysical sense. The story jumps between narrators, so we get to hear from Claire herself, her husband, her grown up daughter, and her mother. Claire’s story is heartbreaking, because she is always able to remember that she is ill, and getting worse, but she isn’t always able to anchor herself in the present, to remember how much she loves her husband, or why her daughters are upset. She can’t be trusted to leave the house alone, she can’t be alone with her young daughter, and she can’t remember the name for the phone. But Alzheimer’s isn’t a disease that only affects the person suffering with it, and we get to see how her entire family are struggling. Caitlin, Claire’s oldest daughter has problems of her own, and The Memory Book is as much her story as it is Claire’s. Caitlin has to deal with the fact that suddenly she has to be partly responsible for her own mother, at a time when she needs her love and advice more than ever. Ultimately, what I loved about this book was the story of a pair of mothers and daughters. The relationship between Claire and her own mother, who has come to stay to look after her deteriorating daughter, is explored less than the one between Claire and Caitlin, but it’s still important, and it has a lot of bearing on the type of mother Claire herself has become. And the relationship between Claire and Caitlin is explored beautiful, both in the present day, and in the memory book entries that the whole family write. 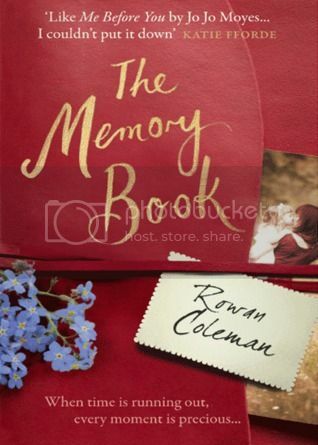 I had heard that The Memory Book was sad, and while I was moved by Claire’s situation throughout the book, I spent 90% of it thinking that it was good, but not one that was going to move me to tears. Then I reached the climax of the novel, and it got me. Mainly with this line. I don’t want to leave my Caitlin, nor my Esther. I want to always be here to tell them I love them, and that whatever happens, they can get through it. It hit a particular nerve with me this week, as I’ve been thinking about my own mum a lot, and I think that was what did it for me in the end. These days, I’m particularly sensitive around a mother-daughter story, particularly one where the mum is going to be making an abrupt exit. In the end I was surprised by how much I enjoyed The Memory Book. I definitely think it was strongest when it was focusing on Claire and Caitlin, and Caitlin and her mum, because I found the stuff with Claire and her husband, Greg, to be less affecting. I wasn’t overly keen on the ‘twist’ that was set up for the entire book, but that I guessed the outcome of quite early on. But ultimately I thought it was a lovely book, and one that focused on a subject that is rarely explored.